The Maddie’s Shelter Medicine family just got bigger — and the new addition is a superstar! From helping animals displaced by Hurricane Sandy to leading efforts to establish community cat programs and high-quality, high-volume spay/neuter clinics, Dr. Sarah Kirk is an animal welfare and shelter medicine leader, and has worked her entire career as a shelter veterinarian, consultant, and emergency responder, most recently as the Medical Director of the ASPCA Field Investigation and Response emergency team. 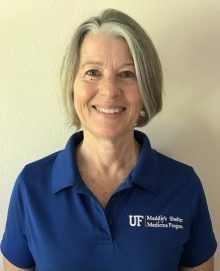 Dr. Kirk brings her experience in shelters as with multiple, large-scale cruelty and neglect cases; forensic examination; report writing; and long-term care of abuse victims to her position as an adjunct instructor in shelter medicine for the Maddie’s Shelter Medicine Program. Her special interests include facility design and population management, and her publications focus on the management of Babesia infections in dogs rescued from dog fighting investigations. She is also a Fear Free Certified Professional. Welcome to the family, Dr. Kirk!